We can see this principle fleshed out in the life of David. In this passage, David is just a young lad. He is a kid fresh from his first battle; but he has already achieved what so few people ever achieve in this life: David has achieved true greatness. I would like to take this text and share with you a few observations from the life of David. 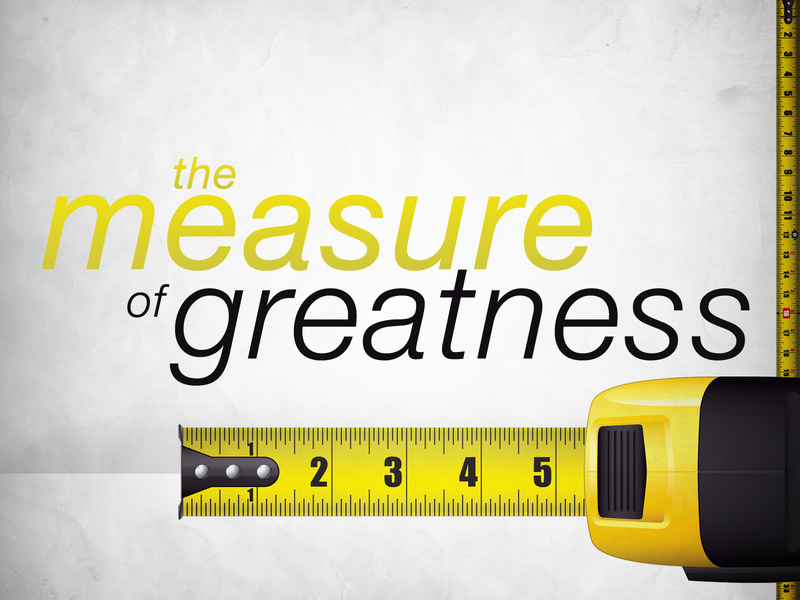 These observations reveal why I say that David has achieved true greatness; and they tell us how we can achieve it too. I would like to take this passage and preach on the subject: In The Presence Of True Greatness. v. 5 He Behaved Himself Well In Spite Of Life’s Promotions – After David defeated Goliath, he continued to prove himself to be a faithful, loyal subject day by day. David did not allow his victory over the Philistine to go to his head. David knew he was climbing to the top, but he was willing to take the climb one step at a time. v. 14 He Behaved Himself Well In Spite Of Life’s Problems – Even when Saul tried to kill him, David still carried himself the right way. David could have become bitter, or he could have been overcome by a desire for revenge. Instead, David continued to carry himself well and set a good example. 1. v. 30 He Behaved Himself Well In Spite Of Life’s Possibilities – David has, through the providence of God, become far more popular than King Saul. David has married into Saul’s family. David has been blessed and he has prospered greatly in Israel. He is in a position to attempt an overthrow of Saul’s kingdom. After all, he is the king! But, instead of trying to elevate himself; David is content to wait on the Lord. David continues to carry himself well in spite of the opportunity to promote himself. v. 10 David Was Surrendered – David knew the king was against him, still David walked into that throne room, picked up that harp and played his music. He had a job to do, and he did it faithfully. v. 11 David Was Steadfast – In his hatred, Saul attempted to kill David. But, notice the phrase, “And David avoided out of his presence twice.” Saul tried to kill David and David ran away. I don’t know about you, but that would have probably finished me up. I would have turned in my resignation and headed back to the sheep fold. But not David! He was steadfast. Even though Saul tried to kill him, David returned to his post and continued doing the job he had been assigned to do. v. 13 David Was Submissive – Even after Saul attempted to take his life, David kept on serving the evil king. David took his new assignment and carried to out to the best of his ability. (Note: In these three verses, David sets a good example for you and for me. Often the difference between the average Christian and the great Christian comes down to a simple matter of priorities. You see, we do the things that are important to us. Those things you attach value to determine the priorities of your life. Everything in your life is touched by this principle. For instance, your church attendance will be determined by what priority it holds in your life. The same is true of prayer, Bible study, witnessing, etc, etc. You do what you think is important. David’s standard of living is one from which we could all take a lesson. At some point, David had determined to be faithful in spite of injury; in spite of trouble; in spite of difficulty. He had made up his mind that he was going to be surrendered, steadfast and submissive to the king, regardless of what took place in his life. v. 7-9; 15; 29The Private Perception Of David’s Life– How King Saul perceived David – King Saul hated David and wanted him dead. When he looked at David, he looked at him through jealous eyes. He saw a young man who was everything he himself was not. He saw a young man who walked with God. He saw a young man who carried himself well. He saw a young man who was ambitious, faithful and clean. And, Saul hated him because of it. Saul hated David so much that he tried to kill him with his own hand. When that didn’t work, he tried to kill David through deceit, v. 17-25. Saul hated David, but he hated him because God was with David and not with Saul. He hated David because David walked with God. The Public Perception of David’s Life – How the people of Israel perceived David – Saul’s private perception of David was one thing, but the public’s perception of David’s life was altogether different. v. 5 Saul’s Servants – The people in the king’s palace saw how David carried himself and they were impressed with David. v. 5, 16, 30 Saul’s Subjects – All of the people saw God’s hand on David’s life and they were impressed with him. v. 1-4, 20, 28 Saul’s Son and Daughter – Even Saul’s own children, Jonathan and Michal love David. There is something about his life that touches them as well. The Personal Perception of David’s Life – How David perceived himself – The only person in Israel who seems to be unaware of David’s greatness is David. When it is mentioned that he might become the king’s son in law, David speaks about his own unworthiness, v. 17-23. David isn’t nearly as impressed with David as the others were. (Note: Here is one of the most powerful secrets of obtaining greatness. The person who possesses true greatness will be the last one to know it! All around us, there are plenty of people who want us to know how great they think they are. They are always talking about themselves and their achievements. They are constantly elevating themselves and exalting themselves above others. But, the truly great person will never be in the business of lifting up his own name or promoting his own fame. In fact, he will be amazed when others lift his name and talk about his greatness. This was the kind of spirit that David possessed and it is the same spirit that we should all strive to have within us. This was also the spirit that dwelt within the Apostle Paul, “I am become a fool in glorying; ye have compelled me: for I ought to have been commended of you: for in nothing am I behind the very chiefest apostles, though I be nothing.” 2 Cor. 12:11. David’s Relationship With The Lord – David was in a faith relationship with God. He was able to say this in Psalm 23:1, “The LORD is my Shepherd; I shall not want.” David knew God is a personal way. His was not a faith based in what his parents knew. He did not worship God vicariously through the prophet Samuel. David knew God on a personal level and that made all the difference in his life. David’s Resources In The Lord – It is said that “God was with him.” David was able to do all that he did because God was with him. He had favor with man because God was with him. He had humility and grace in his life because God was with him. (Note: If you would be great in this life, the first step will be found in your relationship with God. Salvation is the key ingredient in achieving true greatness in life. You see, you might amass fortunes; you might achieve fame and status among men; your name might be a household word; but if you are not saved by the grace of God, you are nothing! When this life ends, and it will, what will you have to show for your life? Nothing but an eternity in Hell! True greatness is found in a personal relationship with Jesus Christ.